Writing books seem to divide into two categories.. Both kinds, at different times, are valuable. There are books that look outward, offering advice about how to do it – create the characters, build a plot, write a breakthrough novel, get your work published and so on – and the kind of book that looks inwards, into the writer and the imagination and the creative act of writing. 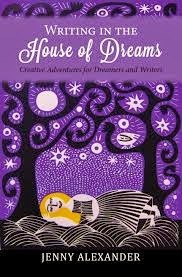 Jenny Alexander’s book, Writing in the House of Dreams: Creative Adventures For Dreamers & Writers, is very much about the workings of that inner writer. Jenny carefully weaves the threads of her own life in Shetland and in Cornwall with her knowledge of psychology, anthropology myths and therapy, and builds a fascinating book for dreamers and for writers. 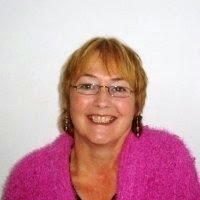 She traces her own growth in understanding and experience, from early struggles and difficult dreams through to her work now as a writer, anti-bullying expert, writing tutor and as a leader of dream-work courses and workshops. Each chapter starts with a brief introduction to a new stage in the dreamer’s journey, a section of Jenny’s personal memoir and an activity. Although Writing in the House of Dreams explains the practice of daily dream journaling and the control of worrying dreams, there are many simpler practical exercises too. Having attended a couple of Jenny’s collage workshops, I know these activities can free up the mind, even if you, too, are not a frequent dreamer. Independently published through Five Lanes Press – that story is within these pages too - this book speaks in a calm and reassuring voice. Writing in the House of Dreams is clearly a work of love and deep thought and, as Jenny herself would say, “a book of the heart”. Jenny also runs a “Writing in the House of Dreams” blog and her companion volume, “When a Writer Isn’t Writing: How to Beat Your Blocks and Find Your Flow”, is published in 2015. Sounds intriguing - and what a lovely title!